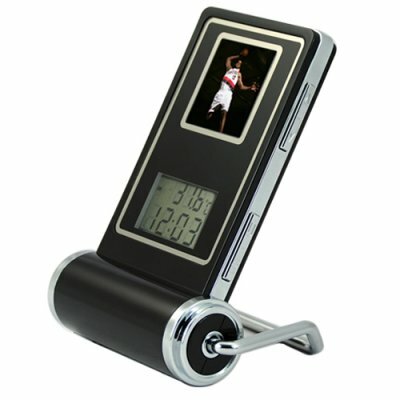 Successfully Added Clock Digital Photo Frame, 1.4-inch Mini LCD to your Shopping Cart. Digital clock photo frame with a 1.4 inch LCD display. Decrease the clutter around your desk by combining your desk clock with your favorite digital picture. Great for the busy businessman or woman to keep track of those long hours spent at work and a reminder of whose waiting at home when they finish. It can be powered by AAA batteries or via USB, so you can place it on your desktop or wherever is most convenient for you. This digital photo frame is a Chinavasion best seller that has been a favorite wholesale import item for the last 3 years. Order some for your own internet storefront to see how it sells. Available in our warehouse, so order your own stock now and you can have it in your hands next week! In my opinion this product is a winner, it's fantastic, everyone should buy one! I bought this for my mum for Christmas and she just loves it, you can put digital photos on it but you should compress them to something like 57.6kps and you can put around 60 photos on it. Also it has an alarm, you can put digital time on it and you can see the degrees- how hot the temp is on it! This is a seriously Kool product! Everyone should/ hopefully will love it - so go on buy one today!